Your business can only be successful if you have a team of great employees. Consider UPS, DHL, and FedEx; they all deliver millions of packages successfully. This is only possible because they have talented management and, most importantly, excellent drivers. However, attracting hard working drivers is not easy. You have to put a lot of effort, time and money into the hiring process. And, you still can’t guarantee that you’ll get the best among the lot. But, there is a simple technique that you can use, namely GPS tracking. GPS tracking devices offer a plethora of benefits and you can use these to ensure the best drivers stick around. Are you wondering how? Read on to learn more. Every driver prefers to work with employers who are serious about their safety. And, GPS tracker can help you do just that. It helps you track what your drivers are doing on the road. So, if a driver speeds up, you can tell him or her immediately to keep to the speed. This will help them avoid any possible road mishaps due to speeding. Also, vehicles can break down at any time. If it happens in the middle of the road in a remote area with no street signs, it can be dangerous for your drivers. This even applies when your drivers travel in unsafe areas, drive late at night or get lost. You can send them assistance in all cases of emergencies. When you plan routes manually, it is difficult to monitor your drivers’ performance. The job becomes even more tedious when you have more drivers. Also, you’ll mostly only learn about your drivers’ poor performance when customers complain. That’s a bad sign for your business. Issues should be sorted out within the company and should not be noticed by the customers. But, GPS tracking can prove to be of immense help here. It provides you with records of your drivers’ activities. You can then analyze these to see how they are performing. You can even provide better incentives to those with the best performance figures. You can use the stats to guide the under-performing drivers by addressing their shortcomings. Drivers would thus be happy, as they would be given the opportunity to earn more money. In this way, you can ensure employee satisfaction which is critical to retain the best talent. Your business can only be successful if your best drivers stay with you for a long time. And, one of the ways to make this happen is to ensure that they don’t have to deal with hassles. For example, a false non-delivery claim made by an unsatisfied customer. The amount of time the driver stayed at the location. Hence, it helps you negate any false claims easily. In this way, you can protect your drivers’ reputation. And, when they know their backs are covered, they would prefer to stay part of your organization. The beauty of using a GPS tracker is that drivers do not need to go through rigorous and boring training processes. They can immediately get onto the road and learn as they go. This is because the drivers will get optimized route details on their smartphone that they’re already familiar with. The GPS tracker will give detailed information such as where the driver needs to go, where to turn, and more. And they can visualize and understand it on their own. This is as opposed to traditional training instructions. So even if the driver is unfamiliar with an area, they don’t need to worry about it at all. This is because all the required information will be at their fingertips. Every driver wants transparency. So, tell drivers upfront that you will track them through a GPS tracker. This means that you can tell where they stop, how fast they go, how much time they are taking at their stops, and so on. Also, make it clear that you won’t do it just to monitor their activities. Instead, this could also benefit them. For example, by tracking how fast they are driving, you can protect them from any wrecks ahead on their route or construction zones. You can do this by letting them know in real time to slow down. 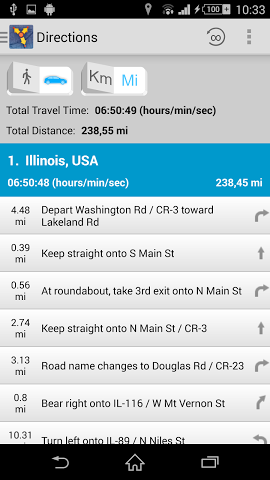 GPS tracking also helps track a driver’s performance. This will help you provide constructive feedback and improve productivity. When drivers know the management can “see” what they are doing, they would work with a peace of mind. It would ultimately improve their productivity and benefit your organization as well. Manual route planning leads to inconsistent routes. For example, a driver might get 20 routes to cover this week but in the next week it could be 5. Also, the routes they follow this week might not be on next week’s list of routes at all. It may even include some areas that they are unfamiliar with. These sudden changes could make them frustrated, affect their productivity, and possibly affect their earnings. No drivers would want that. However, this is not a problem when you opt for a routing software that comes with the GPS tracking feature. You can create a team and assign a certain number of specific routes to drivers. For example, you can create multiple zones to cover for drivers. As an example, if a driver visits east zone areas more, then you can just assign him/her dedicated routes for east zone only. They don’t need to cover north, south or west zones. Similarly, you can create zones and assign respective routes for other drivers well. In this way, drivers will get consistent routes and will be happier due to the predictability in their day’s work. It would help give his or her highest performance levels, create efficiencies through familiarization with the route, and will lead to timely deliveries. Regardless of the job, people complain that their managers do not listen when they bring up legitimate issues. Drivers are certainly no exception, and it is one of the most common reasons that good drivers leave companies. But, this should not be a problem if you have a GPS tracking device in place. For example, your driver may get into a wreck due to over speeding. It is not always that your driver would be at fault. It’s possible that the other party involved in the accident is at fault. Unfortunately in such cases management tends to not listen to the drivers at and they simply take actions against the drivers, or fire them. This is because the management doesn’t have a tool in place that can help them verify what the driver is trying to tell them. By default, they hold their own drivers responsible. But, with GPS trackingyou can see whether the drivers is telling the truth or not. With this example, you could see how fast the driver was traveling. And if not, then you can take actions against the opposite party instead. By simply doing this, you could retain a valuable employee. The driver will be happy knowing that management will get to see his / her side of the story. At the end of the day, that could be the reason that they stay with your company long term. But, it is not only about having to listen to your drivers to learn the truth, this could also lead to improving your business. For example, one of your drivers may tell you that your truck is due for maintenance. If you ignore the warning and something goes wrong, then you are the person to blame. The truck could get pulled over for a sudden roadside inspection and it would lead to legal and monetary hassles. With GPS tracking you can see how many miles the truck has been driven and you can then easily identify if the truck really needs maintenance. This would help you figure out if the driver is correct about the truck needing maintenance. This way, your driver gets to feel that his / her words are valued. You would win out because it would save on costs, hassles and most importantly lead to a happy employee. Drivers often complain that business owners only consider the input of managers or executives and not the drivers. If your managers complain about your drivers, you should not take things at face value. You need to make a decision based on data and not assumptions. Because of this, it is important that you have detailed records or metrics to ensure that the manager is not abusing his/her power. Keeping open lines of communication that do not penalize the driver is important. Otherwise the drivers will be disgruntled to the point of terrible performance. The driver will stretch out this terrible performance as long as possible until he/she is fired. Unfortunately it may take months or years before anyone notices if they don’t know the signs to look for. Some examples are significant reductions in customer ratings and packages delivered per hour, big deviations from routes, and so on. This is where GPS tracking proves to be an immense help. You will have all the data readily available for review so you don’t have to only listen to the manager. You can review and discover the truth on your own. This is the situation where everyone is happy because it appears fair. When they know they won’t be the scapegoat, they will most likely want to work with you and help you obtain great results. So, how do you attract and keep the best drivers? Have you explored GPS tracking devices yet? I like your point that managers will be monitored too and that GPS tracking isn’t just for the leadership to gain control. It’s useful in a number of different industries. Some businesses even use GPS tracking to track boats or construction equipment. Yes, that’s correct. GPS tracking makes business operations go smoothly and become more manageable. It’s also a great way to ensure driver safety. Do you use a GPS tracking device? What do you like the most about it?